The police authorities, on Thursday, arraigned about 130 of the 400 members of the Islamic Movement of Nigeria (IMN), also known as Shiites, before the Magistrates court in Abuja over their alleged involvement in recent clashes with security personnel. They were accused of engaging in violent protest in some parts of Federal Capital Territory (FCT), Abuja, calling for the release of their leader, Ibrahim El-Zakzaky, from detention. Meanwhile, they were all granted bail in various terms ranging from N500, 000, N200, 000 to N50, 000 each with sureties in the like sum. They were arraigned by police prosecutors in batches before courts, 11, 15, 17 and 18 given their large numbers. For instance, 35 of them were arraigned before Magistrate Njideka Duru of Court 11 and were granted each bail at N50,000 with a surety in like sum, just as another batch of 35 who were arraigned before Magistrate Musa Ibrahim Jibo of Court 15 were granted bail at N200,000 with one surety each. Twenty others were docked before Magistrate Lateef Abolaji who granted them bail at N50, 000, while Magistrate Elizabeth Jones Woni granted bail at N500, 000 to each of the 30 brought before her. She equally directed that they must jointly provide three sureties. Those arraigned were mostly male, with about 12 women, some of whom were nursing mothers. According to the First Information Reports (FIR) tendered in court, the sect members were charged with disturbing public peace, causing bodily harm to individuals. (including police personnel and members of the public), among others. The sect members who were conveyed to court in two police trucks, however pleaded not guilty when the charges were read to them, following which their lawyers applied for bail on their behalf. They were however hurled back into the police vehicles pending when they meet their bail conditions. 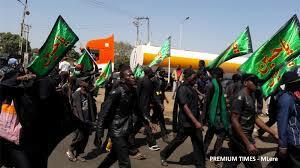 FCT Police Commissioner, Mr. Bala Ciroma, had disclosed that 400 members of Islamic Movement of Nigeria (IMN), also known as Shi’ites, had been arrested in connection with Tuesday’s violent protest in the territory. He stated that the suspects had been detained for discreet investigation, adding that dangerous weapons were also recovered from them. Ciroma further alleged the police recovered 31 bottles of petrol bombs and other dangerous weapons brought in the territory by the suspects.